In 2015, New Zealand introduced considerable reforms to flexible working legislation, for the first time gender neutralising the issue and making provision for all employees, men and women, young and old to apply for a different way of working. This was ground breaking and puts New Zealand at the forefront of the OECD when it comes to flexible work legislation. The organisational response, was to update flexible work policies and ensure that these were well socialised with employees and managers. Many organisations also developed toolkits for managers to help them support employees who wanted to work flexibly. There’s been a strong focus on ensuring that the right IT systems and technology solutions are in place to support remote working. For perhaps the first time, we’ve seen HR and IT heads align their strategies and come together to create the right outcomes for employees. While this is very promising and has certainly led to a higher level of awareness and access, for both employers and employees, it interestingly has not resulted in the anticipated “huge spike” in applications for flexible work. In New Zealand data on flexible work is hard to come by, but in conducting surveys and Diversity & Inclusiveness Reviews inside some of New Zealand’s leading organisations, we have uncovered a number of key barriers which travel under the radar and have yet to be addressed. Our findings indicate that knowledge and awareness is not the key issue. The issue has much more to do with the unspoken behaviours that very few people talk about, but that employees understand first hand. It’s something we refer to as the “sting in the tail” and exists pretty much at all levels in organisations across different industry sectors. So, what are the real reasons employees are reluctant to work flexibly? 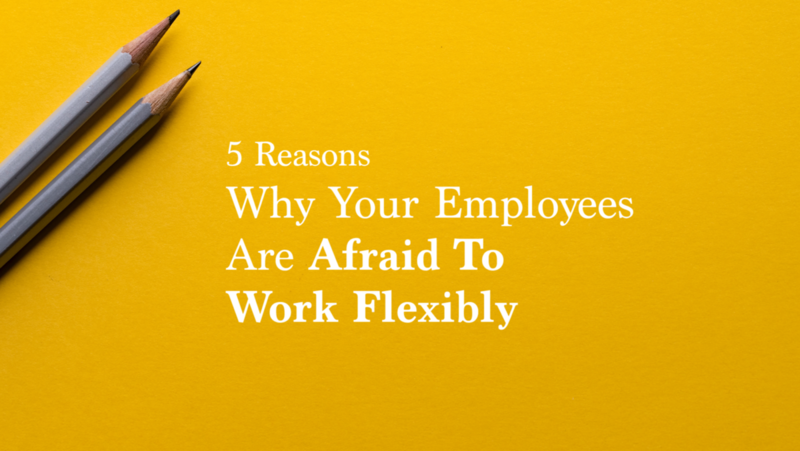 The time has come to confront perhaps the biggest barrier of all to flexible work design in New Zealand organisations – The flexibility Stigma! We need to recognise, table and discuss what’s top of mind for most employees in applying for flexibility. These barriers, whether perceived or real need to be brought out into the open, so that employers and employees can work together to come up with appropriate solutions. In reality, we need a paradigm shift in our organisations. Flexible work design needs to be viewed as a legitimate and productive way of working. We need to shift from an attitude of “tolerance” to one where the infinite value is ‘recognised and rewarded’. This means moving away from an individualistic approach (viewed as a concession by a particularly understanding manager) to just the way we work around here. Looking at it from a much wider “systems” perspective means that we can enrol the wider team and get input from team members and clients on how it plays out and what the impacts and benefits might be. We need to ensure that managers are informed, equipped and have the support they need to overcome any of the biases that might otherwise play out under the radar. Addressing employee fears of being “sidelined’, not getting interesting work, being passed over for pay rises or promotion and being resented by their colleagues are very real and need to be front and centre in the discussion. Make sure that you have the support of your leaders and that flexible work is practiced and valued at the top table. Having your leaders talk about their experiences is a very strong signal that flexible work is a legitimate way of working. Recognise that stigma and bias operate at an individual, organisational and societal level. Managers should be prepared to table the discussion with their employees and actively listen to and understand their perceptions. Starting a conversation with “Is there anything that concerns you about applying for flexible work?…..” will go a long way to uncovering the issues and talking through how to tackle the perceived barriers. Build a culture that engenders trust and transparency. Sweeping the issues under the table as opposed to addressing them head on, is not the answer. Encourage flexible workers to talk to others about their experiences and what is working well. Take an experimental approach. No two circumstances are ever the same. Be prepared to negotiate an arrangement with individual employees that meet their needs as well as those of the wider team and business. Check in often and if it isn’t working, brainstorm an alternative. Sometimes it takes a few iterations to come up with a solution that works for everyone. Consult the wider team to brainstorm ideas and to talk through the potential impacts of flexible work. Taking a team approach ensures that everyone’s needs are met and that solutions are arrived at in a way that serves the greater need. If your employees are client facing, consulting with your clients on the proposed arrangement is the best way to engender loyalty and support. Remember, your clients also work inside organisations who are grappling with flexibility. It won’t be new to them, but if they are part of the solution, they are much more likely to support your arrangement. The reality in most organisations is still quite different. We still equate commitment to your career with having no other distractions or priorities. We still see organisations where presenteeism trumps performance – where for women, asking for flexibility is tantamount to putting on the breaks in their careers and which for men, equates to career suicide. I’m proud of what New Zealand has achieved to date in the arena of flexible work. What we need now is flexible work arrangements that don’t stigmatise, marginalise or disadvantage workers. We are leading the way on so many fronts – let’s have the courage to take it to the next level and at remove the final barrier to creating the change that we want to see.